Dr. Brad Crisp announced last week that Dr. Phil Vardiman, Professor of Management, will begin serving as director of COBA’s online graduate business programs beginning August 1, 2017. Dr. Vardiman will have responsibility for the MBA and MS in Management (MSM) programs offered in collaboration with ACU-Dallas and will interface with other ACU-Dallas programs through their academic and leadership councils. Vardiman earned a Bachelor of Science from ACU in 1976, earned his MBA from the University of Mary Hardin-Baylor in 1992, and holds a Doctor of Philosophy from Texas A&M. Phil has a long history both in education and industry, having served as the Regional Human Resources Director for Cardinal Health from 1997-2000, Human Resources Manager for Avery Dennison Corporation from 1986-1997, and Production Supervisor/Quality Analyst for General Tire & Rubber Company from 1977-1986. He has been heavily involved with human resources and entrepreneurship organizations in both educational and industry settings and has published numerous articles in academic journals as well as presenting papers at 16 academic conferences. Dr. Vardiman also actively consults for businesses, working with them in the areas of human resources, training, quality, safety, and leadership development. Vardiman has taught at ACU since 2002, with special teaching interests in Human Resource Management, Entrepreneurship, Management & Organizational Behavior, Leadership Development, Safety & Health, and Organizational Development. In addition to these teaching interests, he has been active in leading students on COBA Study Abroad trips, traveling to Australia, China, Honduras, and Oxford as well as working with numerous university service activities, advising and club sponsored activities. Known to his students for his “Conceptual Truths” and enthusiasm, to say that Phil Vardiman has a passion for helping others grow and succeed would be an understatement. When talking about his new appointment, Dr. Vardiman says that he is excited about serving on the COBA and ACU-Dallas Leadership Teams and for the opportunity to understand ACU-Dallas better. While serving as ACU Faculty Senate Chair, one goal of his had been to help ACU faculty become more familiar with ACU-Dallas and to build relationships between the ACU on-campus faculty and the ACU online faculty. When asked what his priorities will be while serving as the Director of the COBA online graduate programs, Vardiman said that he will look at faculty, possible changes or additions to course curriculum, and increasing student enrollment. He anticipates looking at the MBA concentrations to affirm what is working and what can be developed to increase offerings to online graduate students, stating that at this time, there is no intention to add concentrations but there may be additions in the future. Dr. Vardiman said that he is most excited about the learning opportunity that this new position will require. His desire is to have a rigorous and solid MBA that is well respected and he is excited to play a part in making that happen. Should current undergraduate students fear they won’t have the opportunity to have him as a professor, don’t worry – he will still be teaching his favorite class MGMT 330 in the fall along with International Business while in the spring he will teach his Safety, Health and Security class. 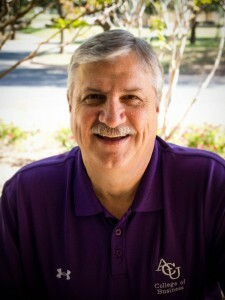 Vardiman said that he was adamant that if he accepted this new positon, that he be allowed to continue to keep teaching undergraduates, stating, “If I lost that, it wouldn’t be worth it.” Teaching is his passion and helping ACU grow into the future is the catalyst for deciding to enter into this administrative role. Dr. Brad Crisp stated his support by saying, “Phil is an excellent teacher and mentor, and he recently completed a term in leadership of ACU’s Faculty Senate. Joey Cope, Stephen Johnson, and I are all excited about what Phil will bring to this role to support the growth and quality of our MBA and MSM program.” Congratulations to Dr. Phil Vardiman on his appointment as Director of COBA’s Online Graduate Business Programs.